Each player will be tested in the 60 yard dash, infield/outfield, & batting practice. What is the purpose of the camp? 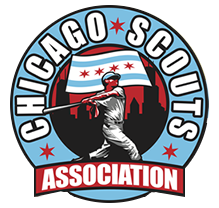 The camps will provide the Chicago Scouts Association with data for future events such as the Silver & Black Series, Fall Teams, & other prominent national events. To register for the camp, click here. MUST print, complete, and deliver the CSA Waiver in order to participate in the camp. Fail to comply will void participation in the camp, no exceptions!